This note concerns about the conclusion of a lemma of a published paper of this journal. Bilevel programming problems are hierarchical problems of two decision makers, where the first decision maker, or the leader, gives his choice and the second decision maker, or the follower, reacts optimally on it and the optimal solution is then used to calculate the objective function value of the leader’s problem. 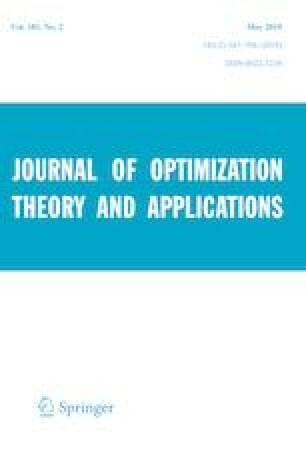 Kohli  introduced two versions of nonsmooth Abadie constraint qualification and employed the weaker version to develop Karush–Kuhn–Tucker type necessary optimality conditions for optimistic bilevel programming problem with convex and nonconvex lower-level problems, using an upper estimate of Clarke subdifferential of value function and the concept of convexifactor. The conclusion of [1, Lemma 5.2] is not correct. Here, we correct its conclusion and also the conclusion of the necessary optimality conditions, which makes use of it. We begin this section by providing a change in the conclusion of the lemma. In the conclusion of [1, Lemma 5.2], \( 0 \in B - A \) should be replaced by \( 0 \in B + A \) [2, Lemma 2.1]. In [1, Example 5.4] and [1, Example 5.5], we can take \( G(x,y) \) from [1, Example 5.6] to achieve our target. In [1, Example 5.6], we can take \( G(x,y) \) from [1, Example 5.2] to achieve our target. Kohli  investigated bilevel programming problem. Here, we correct the conclusion of [1, Lemma 5.2] as well as the conclusion of optimality conditions, which makes use of it. The author is grateful to the Editor-in-Chief for his constant guidance.